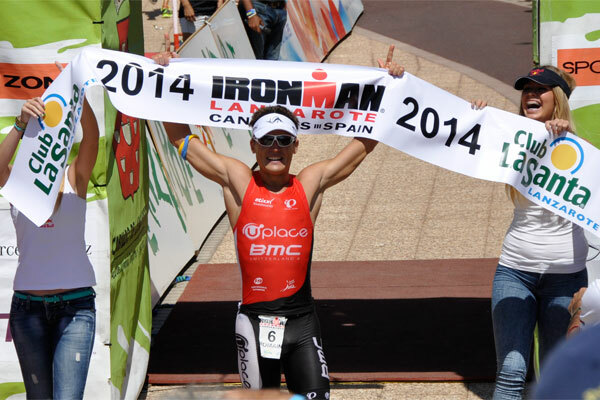 The Lanzarote Ironman 2014, proved to be a dynamic success for both Romain Guillaume of France and Lucy Gossage of Britain, when they both proved dominant in winning this testing event. 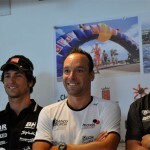 The Lanzarote Ironman had its largest entry list in history, with the entries going over 2000 for the first time. The weather was hot all week, and on race day the standard of racing matched the heat of the day. Starting off in favourable conditions, the triathletes entered the sea with their normal ferocity. Seeing the start is quite an experience, it is for the beginner triathlete an overwhelming occasion. Guillaume was well placed coming out of the sea in 47:31, the fastest swim time by a winner in more than 10 years. The Dane, Henrik Hyldelund, was ahead of him at 47:19 with Belgium’s experienced Bert Jammaer also in close contact with his 47:51. The Frenchman, was now moving onto his specialist event, the cycle leg of 180km, which would take him across the stark terrain of the volcanic island. 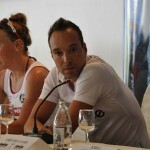 Guillaume had said, in the Press Conference the day before, that he would attempt to hold back on the bike and would look to save something for the run. 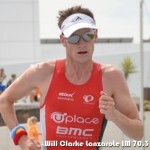 The likeable athlete, had switched coaches and teams just 5 weeks before the Lanzarote Ironman, and on first site, he looked to be hammering the bike leg. He had moved ahead of the Dane, but then allowed Hyldelund to take the lead off him. To those in the press tent, the discussion was whether he was experiencing problems. After the race, he would remark that he was in control throughout the cycle leg. Guillaume retook the lead approaching Teguise and he would not relinquish his lead for the rest of his island journey, however, we were none the wiser and had remarked how the highly fancied Jammaer was only 4.30 behind. Surely, not enough time to hold off the charging Belgium over the run leg. Estimates were given, that the Frenchman would in all likelihood need 10 minutes to hold off the charge of the man in blue. Guillaume had an amazing transition and opened a further 40 seconds on Hyldelund, who would fade to a 5th place finish with an overall time of 09:09:14, after a ‘painful’ 3:18:13 marathon run. 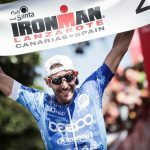 Jammaer catching Guillaume never transpired, eventhough the man who has won the Lanzarote Ironman on 2 occasions closed almost 2 minutes over the first 21km of the marathon. Jammaer would state after the race, that he had made the mistake of trying to win the race too early into the run, and he paid the price with Spain’s Miguel Tinto Blanchert pouncing on the opportunity to run down the Belgium over the last 4km, to take 2nd place in 8:58:06 with an impressive 2:48:12 marathon run. Guillaume closed with a 2:57:55 marathon and an overall time of 8:47:39, for a 10 minute victory, a super impressive victory when considering all the fears that were being expressed before the run that things would ‘blow up’, as this has been a trademark in the past. Not so, the youngster has come of age, and the changes made have had a positive effect on this ‘thoroughbred’. A great confidence boosting win for the Frenchman on the toughest course of all. The women’s race turned into an intriguing affair, once last year’s winner Kristin Möller emerged from the swim some 7 minutes behind the leaders, we were left wondering where the fireworks would come from. The fact that the big hitters were not amongst the lead provided a sense of WHEN. When would the more fancied triathletes make their presence felt. Germany’s Susan Platt and the UK’s Lucy Gossage would provide the tight contest in the Women’s race, that those in the media were looking for elsewhere. Gossage, had mentioned that she had hoped to finish in the Top 2 at the Press Conference, though she couldn’t be drawn into thinking that it could be #1, especially after her 2nd placing in South Africa, the beginning of April. First out of the water was Belgium’s Stefanie Adam, in a time of 55:04, and knowing her strength on the bike, we knew that the more favoured would be chasing Adam for much of the cycle leg. Platt would give pursuit, after her swim time of 56:28 which she followed up with a bike ride of 5:27:07, she moved into the lead. With an excellent transition, she had moved further ahead. Gossage had stuck to her plan of riding according to her ‘power meter’, never pushing the unnecessary power while in the saddle. 1km into the run, Gossage, was 2.45 in arrears to Platt, and with the Brits superior running ability, we knew that the athlete from Messel, would have her work cut out, if she was to hold her rival at bay. The much vaunted, Corinne Abrahams, would start the charge for the top spot on the run leg. Much was expected of her, after her success in Australia, however from the safe enclaves of the finish area, the athletes were now having to run 5km into a headwind on each loop. This was making the run into a true test of will and endurance. Gossage had ‘kept her powder dry’, and was able to take the lead at 24km, after whittling down the minutes over the first 21km in a very controlled and confident manner. Platt did well to hang onto the ‘coat tails’ of Gossage for the next 6km, and would run a 3.14 marathon split, to keep the charging Abraham at bay. Abraham would take 3rd spot with her 3:06:10 marathon, however her 5:42:53 cycle leg would prove to be her undoing. The Women’s victor was in her element at the finish, deservedly so, after winning this year’s gruelling Lanzarote Ironman in an overall time of 9:41:40.